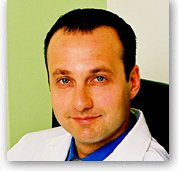 Alexander Rivkin M.D. is a Yale trained facial cosmetic surgeon and UCLA faculty member who focuses exclusively on providing his patients with the latest in non-invasive, non-ablative cosmetic treatments. Dr. Rivkin is an international authority on non-surgical cosmetic treatments. He divides his time between patient care, clinical research, educating other physicians, media appearances, and lecturing at scientific conferences throughout the world. Dr. Rivkin understands that no one relishes the thought of “going under the knife,” and believes modern medical technology can provide today's patients with superior alternatives to invasive, painful surgery. He has dedicated his career to developing these alternatives, creating exceptional cosmetic solutions that his patients can access without the fear, which has so long been associated with cosmetic surgery. He has been featured on the TODAY show, the TYRA Show, E!, EXTRA, Univision, PBS, KNBC-TV, KABC-TV and throughout the national and international media for the innovative procedures he has invented. He was the first physician in the country to offer the “Non-Surgical Nose Job,” his signature method for non-invasive correction of cosmetic nasal irregularities. Visit www.westsidemedicalspa.com for more information.